How to watch Mumbai Pune Mumbai 2 (2015) on Netflix Canada! 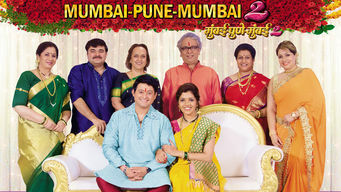 Yes, Mumbai Pune Mumbai 2 is now available on Canadian Netflix. It arrived for online streaming on December 15, 2017. We'll keep checking Netflix Canada for Mumbai Pune Mumbai 2, and this page will be updated with any changes. An upcoming wedding is fraught with uncertainty after the bride-to-be begins to have doubts about her decision to get married. Dark clouds appear on the horizon for a couple as they prepare for their much-awaited wedding.